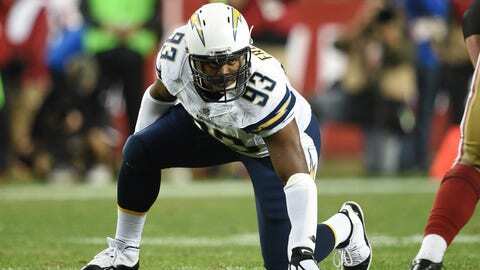 Dwight Freeney, a seven-time Pro Bowl player, has 111 career sacks and led the NFL with 16 sacks in 2004. TEMPE, Ariz. — The Arizona Cardinals have signed veteran defensive end/outside linebacker Dwight Freeney to a one-year contract, a person with knowledge of the situation said Monday. The move comes after the Cardinals’ top outside pass rusher, Alex Okafor, went down with a calf injury in Sunday’s 42-17 victory at Detroit. The 35-year-old Freeney, a seven-time Pro Bowl player and three-time first team All Pro, ranks 21st in the NFL in career sacks with 111 and led the league with 16 sacks in 2004. Okafor was sent back to Arizona for tests and there was no word on the severity of his injury. Another Cardinals player, inside linebacker Kenny Demens — a significant contributor on special teams — tore an ACL in the game, coach Bruce Arians said. The Cardinals are spending the week at The Greenbrier resort in West Virginia, using the New Orleans Saints’ training camp facility there to prepare for Sunday’s game at Pittsburgh, rather than making two long flights to and from Arizona. At his regular Monday session with reporters, Arians wouldn’t comment on the Freeney reports. "But the young guys came around," Arians said. "There wasn’t an opportunity. Now there’s an opportunity." Freeney has 43 career forced fumbles but his speed off the edge has diminished with age. He hasn’t had double digit sacks since his 10 in 2010. Still, he had 40 quarterback hurries last season, along with 3 sacks.